Before the Bosnian war, Mirjana Parhomov was a safety engineer living quietly in the town of Bijeljina, Bosnia. During the war’s aftermath however, she was one of many who were left without a job, an income and a home. In 2003, Mirjana took her first loan from MI-BOSPO to start a business. Her idea was to re-start her father”s former enterprise—a water mill—and use it to produce flour. The income she received from the business helped her family survive a difficult period. When she is not working at the mill, Mirjana goes around to nearby restaurants and offers her products. 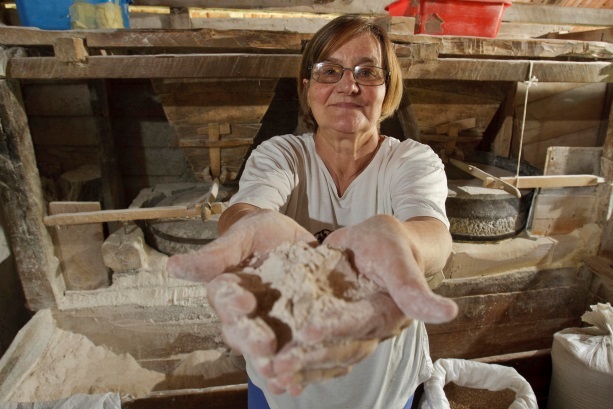 Today, Mirjana produces many products from different types of flour, satisfying the various needs of her customers. Her story describes the impact of empowering low-income women with financial access: with just an idea borne of a need combined with hard work and the opportunity of a loan, a profitable business is created, generating employment for the community is well. MI-BOSPO is proud of its clients like Mirjana and their success.